At-home care is a beneficial service for many people in our country who require medical assistance in the comfort of their own home. North Carolinians who are ill, recovering from a medical procedure, or are advanced in age, will may need professional care to recover or retain their independence. If you are in need of home health care in Greensboro, Charlotte, and beyond, Mission Medstaff is here to help. Our adult and pediatric home care providers are held to stringent standards to ensure the best possible services for our patients. While our home health nurses strive to deliver the best outcomes, many people are unaware of how convenient our services can be. Today, we’ll look at a few benefits you can expect when bringing in an in-home care team for your loved one. If you want to learn more, be sure to contact us today! 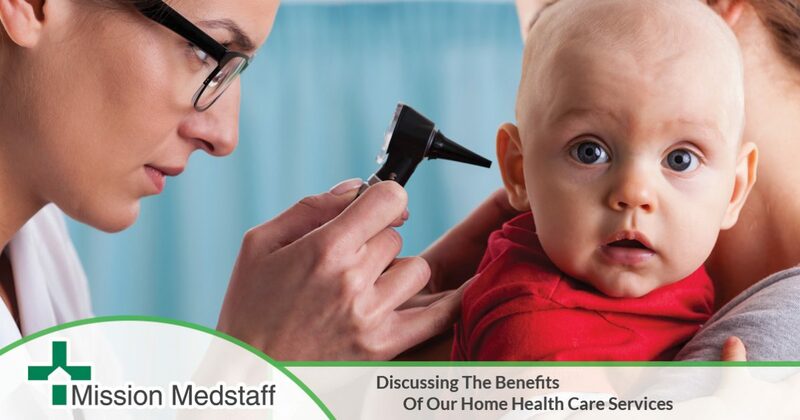 The biggest and most beneficial reason for hiring one of your local home health agencies is the freedom it gives your loved one in terms of receiving care in the comfort of their own place. Hospitals and retirement homes are valuable options, yet they lack the privacy and comfort many people seek during such tough times in their lives. Being able to focus on your recovery in your own environment is preferable to the alternatives. With a familiar setting also comes an increase in overall comfort. There is no place like home, and Mission Medstaff is here to keep it that way! People enjoy the comfort of their own home, with a familiar layout and numerous possessions and keepsakes. While health care facilities are ideal for numerous applications, they cannot match the comfort of having your loved pets and family members by your side. Mission Medstaff’s elderly home care program aims to deliver comprehensive care to geriatric patients that works to improve their lives while providing the freedom that everyone craves. Few things are more difficult than losing your independence, and our caring staff will work hard to ensure that your loved one lives on their own property on their own terms. Retaining pride and dignity are important parts of our program, and they help optimize our patients’ lives in every way possible. Anyone recovering from a major surgery or grievous injury will likely be laid up for a time in order to heal properly. Unfortunately, health care facilities like hospitals are a breeding ground for bacteria and infections due to the high amount of traffic and a large population of unhealthy individuals. The risk of infection is much higher, even with stringent cleaning protocols. While finances shouldn’t be the focus of any medical provider’s services, the fiscal costs are an important part of the patient’s decision-making process. Our quality in-home care personnel strive to provide top-notch services that are efficient and effective, saving you money in the process. When compared to inpatient care at a hospital, Mission Medstaff is a much more attractive option when price tags are considered. We strongly believe that our passionate home care services are much more valuable and cost-effective when compared to any other viable options out there for you or your loved one. When you receive adult, pediatric, or senior home care from Mission Medstaff, you’re receiving personalized attention that perfectly fits your lifestyle and unique medical needs. Our nursing staff is proud to provide family-focused services that are tailored to comprehensively optimize your at-home care. Having a dedicated team of professionals that know your family on a deeper level helps to make us part of your family instead of a cold service provider. Our top-notch staff is also available 24 hours a day, seven days a week to ensure round the clock care. While the prospect of calling for home health care in Greensboro may sound intimidating, it can prove to be a smart choice for the health of you or a loved one. From pediatric patients with complicated health issues to senior citizens who need a little extra help after a surgical operation, Mission Medstaff is here to help. Every service we offer is done to optimize your quality of life now and in the future. Each health care professional is bonded and insured as well. Contact us today to learn more!